When Zurg challenges freedom with a new machine, Buzz Lightyear of Star Command gets ready to send the evil action figure into orbit. 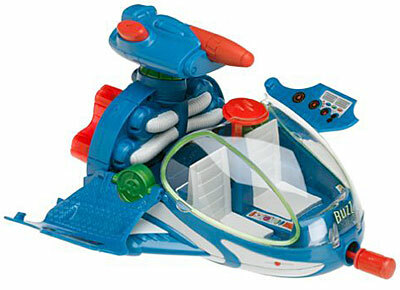 Defend the universe with this electronic spaceship playset with action features. Lift the doors of the advanced cruiser to reveal the command center for special missions. The cockpit opens and you can place action figures inside. When Emperor Zurg visits, press the button to fire the toy projectile, or activate the second missile from the launcher that attaches to the top of the ship. Light-up engines simulate blast-off and make cool electronic sounds.